Margins of the Labor Market?" 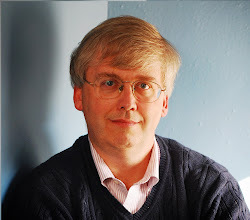 written for the just-completed Spring 2014 conference of the Brookings Panel on Economic Activity. To get a sense of the issue here are a couple of striking figures from Krueger, Cramer, and Cho. Split up those unemployment rate into three groups: those unemployment for 14 weeks or less, those unemployed for 15-26 weeks, and those unemployed for more than 26 weeks. What do the patterns look like, both over time and more recently? 1) In the last 65 years, the short-term unemployment rate, 14 weeks or less, has been higher than the middle-term or long-term unemployment rate. But for a time just after the Great Recession, the long-term unemployment rate spike so severely that it exceeded the short-term rate. 2) In the last 65 years, the medium term unemployment rate for those without jobs from 15-26 weeks moved in quite a similar way and at a similar level to the longer-term unemployment rate for those without jobs for more than 26 weeks. But after the Great Recession, the long-term unemployment rate spiked far out of line with the medium-term unemployment rate. 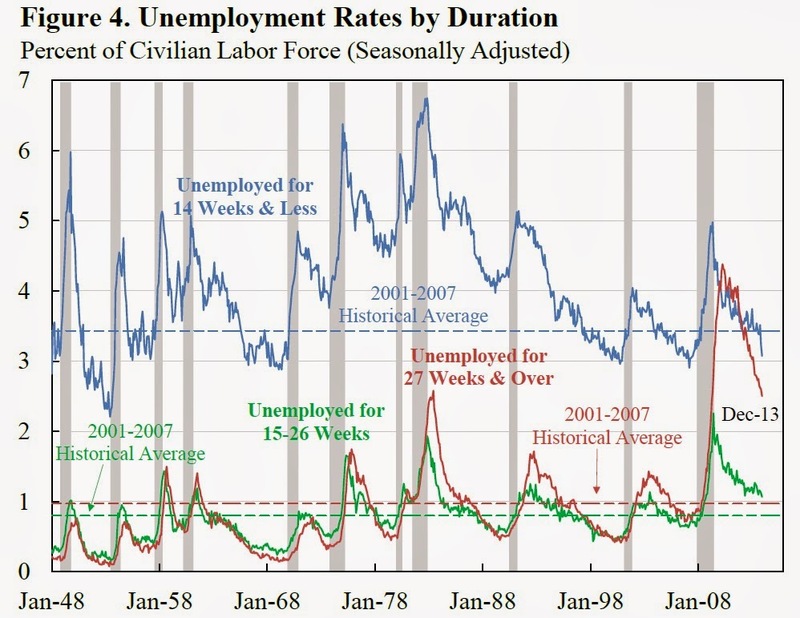 3) Moreover, notice that right after the Great Recession, the long-term unemployment was spiking at a time when the short-term and medium-term unemployment rates had already peaked and had started to decline. 4) The short-term unemployment rate is now below the pre-recession average for the years 2001-2007. The medium term unemployment rate is almost back to its pre-recession average. The long-term unemployment rate, although it has declined in recent months, is still near its highest level for the period from 1948-2007. "The short-term unemployment rate is a much stronger predictor of inflation and real wage growth than the overall unemployment rate in the US. Even in good times, the long-term unemployed are on the margins of the labor market, with diminished job prospects and high labor force withdrawal rates, and as a result they exert little pressure on wage growth or inflation. Even after finding another job, reemployment does not fully reset the clock for the long-term unemployed, who are frequently jobless again soon after they gain reemployment: only 11 percent of those who were long-term unemployed in a given month returned to steady, full-time employment a year later. The long-term unemployed are spread throughout all corners of the economy, with a majority previously employed in sales and service jobs (36 percent) and blue collar jobs (28 percent), they find." For me, one of the most troubling of the graphs looks at long-term unemployment rates across other high-income countries. The figure shows what share of the total unemployed in a country qualify as long-term unemployed--that is, what share of the unemployed have been out of work for more than six months. Historically, the U.S. and Canadian economies have been places where the long-run unemployed were maybe 10-20% of total unemployment. 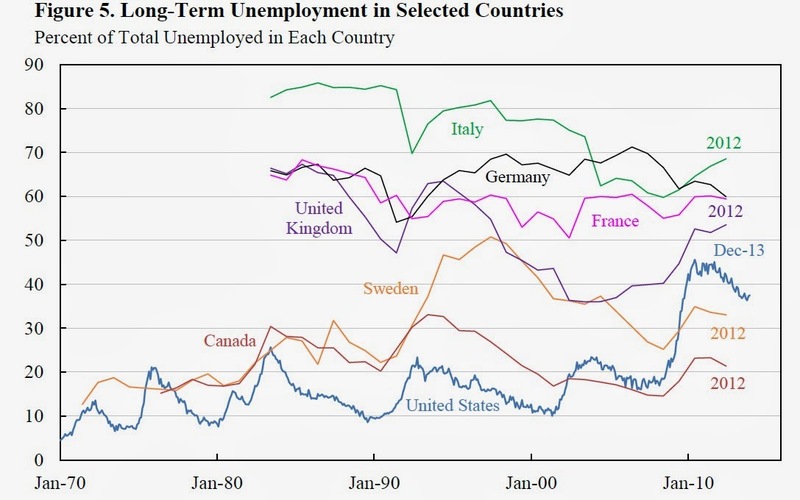 Meanwhile, in countries like Italy, Germany and France, the long-run unemployed were often 60-70%, or more, of total unemployment. The fundamental meaning of what it means to be "unemployed" is pretty different, depending on whether the experience is usually fairly short or usually fairly long. In the U.S., the share of the unemployed who are long-run unemployed hasn't yet reached some of levels common in those other economies. But the experience of those other countries points out that when the share of the unemployed who are long-run unemployed is very high, that situation can persist for decades. I'm not sure exactly what policies will work best for bringing the long-term unemployed back into the labor force. But Sweden and Canada, to pick two examples from the figure, have apparently had some success in doing so. But it's reasonable to worry that past U.S. approaches to addressing unemployment are not well-suited to the long-run unemployment that emerged after the Great Recession.